Fran Charles is an American television presenter for MLB Network, formerly for NFL Network. Charles received his Master's degree from the Columbia School of Journalism after completing his Bachelor's degree in Communication at Stanford University. Charles began his career in broadcasting in St. Louis, Missouri as an overnight reporter, news writer and assignment editor at KSDK-TV. A year later, he became a weekend sports anchor at WDTN in Dayton, Ohio. After three years in Dayton, Charles became the weekend sports anchor at WHDH-TV in Boston. Charles served as the blow-by-blow announcer for the HBO Sports series Boxing After Dark from 2000 to 2007 and has also worked on KO Nation, HBO Pay-Per-View Boxing and World Championship Boxing. From 2002 to 2006, Charles was the host of the weekly golf show, PGA Tour Sunday on USA Network, serving as lead anchor for studio segments during PGA Tour events. Additionally within the NBC family of networks, Charles was an anchor and reporter for NBC Sports, where he anchored the weekend Sportsdesk show and provided live reports and interviews for NBA on NBC. He also anchored sports at the WNBC in New York City while working at NBC Sports. 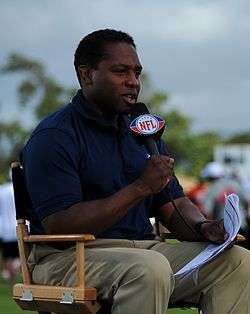 Charles joined NFL Network at the start of the 2006 season and shares duties as host of NFL Total Access with Rich Eisen. Beginning in 2010, Charles hosts NFL GameDay Final, joining Steve Mariucci, Deion Sanders and Michael Irvin to cap off all of Sunday’s action with the latest highlights, interviews and analysis from each game. During NFL Network’s Thursday Night Football schedule, Charles, alongside analysts Kurt Warner, Sterling Sharpe, Jay Glazer, Brian Billick and Jim Mora, hosts Thursday Night Kickoff Presented by Sears from Los Angeles. He also is the studio host for NFL Network's coverage of the Arena Football League. Charles was featured in EA Sports' Madden NFL 10 as the main host of “The Extra Point”, a weekly recap show that broke down the highs and lows in a network-style show. Alex Flanagan was his co-host. Charles made MLB Network debut as studio host during the 2013 World Baseball Classic on March 9. ↑ "Fran Charles joins MLB Network's On-Air Talent Lineup". News. MLB.com. March 4, 2013. This article is issued from Wikipedia - version of the 10/12/2016. The text is available under the Creative Commons Attribution/Share Alike but additional terms may apply for the media files.